The Master of Science in Human Environmental Sciences, area of study in Interactive Technology provides students with unique insights into the role that technology plays in the productivity of consumers in both the home and the marketplace. This online area of study offers students insights into human interactions and the many ways technology facilitates consumer activities in their environments. The Interactive Technology area of study provides students with an understanding of computer-mediated interactions and technical skills related to emerging technologies, across a broad spectrum of industries and professions. Consistent with Consumer Sciences’ historical insights into the ways consumers enhance productivity in the home and marketplace, this area of study augments students’ capabilities as consumers and producers at home and in the market. The vast majority of students in this online graduate program are employed full time. Students seek this area of study to enhance their consumer-focused careers by increasing their understanding of the ways technology both improves, and detracts from, human interactions at home and in markets. A representative sample of current Interactive Technology students’ positions include: customer support analyst, communications coordinator, program analyst, media production specialist, public relations/marketing manager, cyberspace operations officer, non-profit director, strategic communications director. This additional expertise in the role of technology in consumer interactions is beneficial to students as both consumers and producers in the marketplace. Interactive Technology students have had backgrounds from such industries as: health-related industries, various businesses in marketing and retail, as well as professionals in law enforcement, real estate, manufacturing, politics, sales, and financial planning. Students also enter the program from traditional information technology and computing backgrounds, although this is not the focus. Due to this Masters degree being completely online, our program is also a favorite among those associated with the military around the world. All courses are online and asynchronous, using computer-mediated tools. The courses focus on methods of designing, selecting, and coordinating electronic messages, products, services, systems, digital environments and software for use in organizations. Learning activities focus on how organizations and individuals interact with technology and the resulting changes associated with the emerging knowledge workplace. The curriculum is dynamic, with course content changing within the goals and objectives of the course each term to reflect the changes in the digital tools and the environments in which these tools are applied and as a means of keeping the content relevant to the changing technology landscape. Activities in the curriculum are designed to encourage students in the program to apply their emerging skills to situations and opportunities within their chosen career paths. There are no residence requirements, no on-campus orientation meetings, and no final meeting on campus. Students may live anywhere and participate if reliable Web access is available. Students must own their computer system and software, e-mail account, and have an Internet Service Provider. As a distance learning student, students will interact with the same college professors and meet the same learning standards as an on-campus student, as well as have access to the same UA resources. 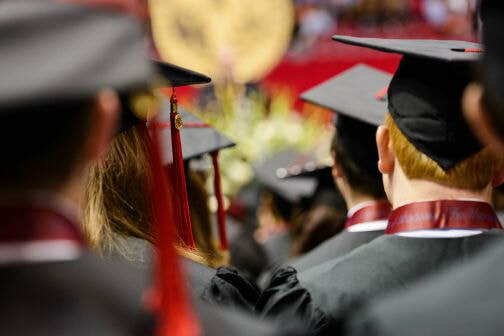 Just like the many generations of previous University of Alabama graduates, Interactive Technology students will be invited to participate in graduation commencement ceremonies and activities on campus alongside fellow students. Participation in Commencement is not required, but we would love to have you on campus!